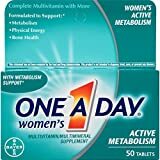 One A Day Women's Active Metabolism is a multivitamin with added caffeine. 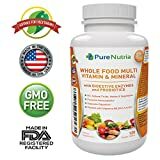 In addition to the caffeine, this version of One A Day has B vitamins and Chromium designed to promote an active lifestyle. One A Day Women's Active Metabolism contains 22 different supplements in each tablet. Women should be aware of their caffeine tollerance when using this product and mindful of caffeine amounts from other sources when using it. Calcium Carbonate, Cellulose, Caffeine Powder, Magnesium Oxide, Ascorbic Acid, Ferrous Fumarate, Guarana Seed Powder, Croscarmellose Sodium, dl-Alpha-Tocopheryl Acetate, Maltodextrin, Acacia, Zinc Oxide, Dextrin, Gelatin, Crospovidone, Dicalcium Phosphate, Titanium Dioxide (color), Niacinamide, Silicon Dioxide, Magnesium Stearate, D-Calcium Pantothenate, Manganese Sulfate, Cupric Sulfate, Polyethylene Glycol, Pyridoxine Hydrochloride, Riboflavin, Thiamine Mononitrate, Calcium Silicate, Dextrose, Soy Lecithin, Vitamin A Acetate, Chromium Chloride, Folic Acid, FD&C Blue #1 Lake, Beta-Carotene, Sodium Selenate, Biotin, Phytonadione, Cholecalciferol, Tricalcium Phosphate, Cyanocobalamin.